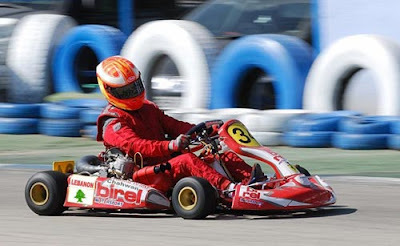 Georges Chahwan competes regionally in karting championships. Competing against 25 other drivers, Georges Chahwan, assistant to the head of Unipak Tissue Mill power plant, raced to 7th place in the first round of the Middle East Karting Cup. At 24 years old, Georges began karting when he was five. In 2005 and 2006, he placed in the Top 5 of the National German Karting Championship and Berlin Karting Championship. Georges heads the Schahwan Motor Sport Racing Team, which plans to increase awareness of road safety among young Lebanese. The team, whose philosophy “Don’t Drink & Drive, Arrive Alive”, will coordinate with Lebanese rally drivers and social associations, such as YASA, kunhadi and others, to organize conferences for schools and universities.